I need to hyper focus, meaning I need to stay closely focused on any task to ensure that I fulfill the assigned task the best that I can. Sailing and photography, drawing as well, are my main tools to use this intense form of mental concentration that allows me to fully be in touch with my consciousness and convert an everyday experience into a memorable, positive adventure addition to add to my story. Recently presented a seminar for Shardana Sailing Charters and Osprey Point Inn on smartphone/tablet photography. The reviews and comments were all very positive which makes me feel good but I also realized that part of my “presentation skill set” is hyper-focusing on the task at hand. The audience was there in front of me, but also was a part of me and my presentation. I was so intent on presenting the message “Smartphone Photography for the Sailor” that I went beyond the scope of presenting and became THE audience as well. For me and perhaps for you, great photos are composed in part by the photographer’s technical skill, equipment, and creative vision. Certainly for me “hyper-focusing” on the subject is my other main “driver”. The Zen term is being one with the task at hand. Some photographers use the term pre-visualizing and sailors use the term “in the groove” to define hyper-focusing. Stop taking photos and start creating art! Taking pictures is easy, you see something you like, raise the camera, smartphone or tablet and click the shutter. Creating art takes a few more steps and those steps include being aware of the light that paints the subject—-and the light is for many the “thing” that makes the image the image. Think about a scene or subject in the shadow, in the bright sun or in a muted lighting situation. The dynamics of the image change based on the lighting. The same is true with sailing. Sailing in a light to moderate breeze has multiple levels of success, the force of the wind, the size of the boat and your skill set and that of your Captain/crew add to or take away from your experience – your story! When you are comfortable with your sailing skill set, you can sail in an intense wind. When you are comfortable with the boat, you can tack, gybe with ease and enjoy a greater level of the sailing experience. Part of your skill set, and comfort level is being able to concentrate (hyper-focus) on the task at hand, that is what I do when I teach sailing, Captain a Shardana charter, or take a photograph. I place myself (not lose myself) in the situation. Being hyper-focused makes any task easier, it removes the hard edge, the block that often is a key component, a restriction of any new or repetitive task. Hyper-focusing also reduces and in many cases removes the fear factor from the action you are undertaking. What is YOUR end result? 5) Did the event add to your life’s story? Simple? Yes! Simple for all, be aware of the situation, often called “situational awareness” – danger lurks in the shadows and on the horizon. Define your goals and objectives, know your limits and your skill set, finally define the purpose of your adventure, be ready to learn, expand your skill sets and yes have fun. Hyper-focus on the situation and be in the moment— your moment and be ready to enjoy a great experience. Your experience! When I Captain a charter or teach photography I attempt to allow all the crew or the students to be aware of the points listed above. I personally get involved wile allowing the photographer or crew to take the wheel; create an image and discuss what happened—good or bad. I also ask they look beyond the task at hand and become the task at hand, closing their mind to the many distractions (for your safety, always being aware of your situation) that life brings and hyper-focus on your goal, action or objective. You are now living in the moment, in the groove, sailing and making your story. Sailing and photography are more to me than just things to do. These activities are deeply rooted in visceral and instinctive actions as THE things to do that all get better when I add hyper-focusing to the equation. This makes me one with the subject or scene… or wind, boat and water; making my life experiences better, as they will for you. Need to “feel” more, talk about hyper-focusing, photography or sailing, email me at thad@tbkphotos.com and we can engage on this topic and more. Do you need a copy of my smartphone cheat sheet for sailors, let me know and I will email you the free cheat sheet? As a field archaeologist, I am used to spending my summers excavating in Israel, and intermittently since 2005, at the Philistine site of Tell es-Safi/Gath. Due to their biblical notoriety as adversaries of the Israelites, the Philistines are the best known of the Sea Peoples, various groups of seafaring emigrants with piratical tendencies who invaded Egypt around 1200 BCE and settled along the coast of southern Israel. In 2018, I decided to make a change, and instead of excavating at Tell es-Safi, I spent the summer as a member of the Tel Akko Expedition in search of the Shardana. To most, the Shardana are not as well known as the Philistines. They are another group of Sea Peoples who are thought to have settled along the coast of northern Israel, and the remains of their material culture have, unlike the Philistines, been particularly elusive. As a Sea People, the Shardana may have taken their name from, or leant their name to the island of Sardinia. It was particularly poignant for me to begin working at Tel Akko, the site with the best chances for uncovering the material cultural remains of the Shardana, as the previous summer we had just launched our new Catalina 425 named after these elusive Sea Peoples. Admittedly, since my research focused on the Philistines, I had originally lobbied to name the boat “Phyllis Stein,” but Andrew and Davis quickly quashed my proposal. That is when friend and colleague, Tanya McCullough, suggested we name the boat after the more melodious sounding Shardana. Although I love the process of excavation and the discovery of the finds on site, my time at Akko was spent back at the (air conditioned!) field school, registering the finds and sorting all of the many shards of ancient pottery coming out of the excavation. The field school, where the team sleeps, eats, and does the off-site office work, is located, by the way, at the Israel Nautical College right on the beach in the city of Akko, which trains cadets and officers, master mariners and nautical engineers for the merchant navy. On most mornings in the summer, you can see the Sea Scouts doing calisthenics on the beach and dragging their sailboats from the boat sheds into the waters of the Bay of Haifa. The cruising life. Gently swinging on an anchor. Swimming off the stern. Nodding off to the rhythmic lap of water on the boat hull. Waking to the sounds of birds calling and workboats thrumming through the mist. Climbing above deck to begin a new day, the pungent smell of coffee brewing in the galley. This is cruising the Chesapeake Bay. How you see the world, from a sailboat versus on land, is a whole new and unique experiential paradigm. The Chesapeake Bay has over three thousand miles of shoreline to visit, with 48 rivers and hundreds of creeks, providing a lifetime of explorative destination possibilities. Chesapeake Bay cruising by sailboat charter means having a floating hotel for overnight voyaging from place to place. Cruising by sailboat really is a luxurious off-the-grid adventure —it is a great experience for anyone and everyone who have tastes for exploration and a desire to see and feel the world from a unique perspective. It is an experience which most people can only dream to get a chance to participate. However, Shardana Sailing Charters enables you to take advantage of enjoying the Chesapeake Bay from the water. What and how can you relax on a cruise? There are so many options. From hanging on a hook in a quiet cove watching nature, rafting up with other boats and friends, taking the dinghy to a beach or the local town pier to explore, star gazing and swimming off the back of the boat—to name just a few. Staying out overnight on the Bay can range from grabbing a mooring in Spa Creek at Annapolis, to anchoring in an undeveloped nook on the Chester River or Worton Creek (where you can see some of the best sunsets on the entire Chesapeake Bay, to taking a transient slip at a marina in St. Michaels. No place on the Chesapeake is too far to go if you have a few days, a comfortable boat and a capable captain. There really is no better way to appreciate the Chesapeake’s beauty than to encounter it up close and personal on a small vessel. It is a personal sojourn you will never ever forget. Click Here to see pictures for some of our trips. Make this year the year you try something new, fun, local, and different. I grew up surrounded by water on Staten Island, New York—a born and bred NYer. I have been on or around boats since the ripe old age of 8. Growing up on an island in New York City I was always fishing, boating or playing in or around the water. I am half British and had the good fortune to spend my summers in England visiting my extended family. I also spent time in Long Beach Island at the NJ shore. My english family owned many boats sailing the north west coast of England and Wales. I experienced my first multi-day boating trip exploring the Caledonian Canal and Loch Ness in Scotland with my uncle, cousins and sister. We didn’t see Nessie (the Loch Ness Monster) but we did try to find him/her. As I grew older I earned an undergraduate degree in Physical Geography and Environmental Systems from the State University of New York at Buffalo. After university I moved into Manhattan, New York. While living in Manhattan I learned how to sail. Yes! New York City is a HUGE sailing town. I moved to Philadelphia where I became a member of Liberty Sailing Club for 15 years racing and cruising J-27s on the Delaware River. My friends/fellow sailors from the club exposed me to the wonderous Chesapeake Bay—one of the greatest cruising grounds in the world. I fell in love with the Chesapeake Bay. The rest as they say is history. I enjoyed the club so immensely I became a Director for several years as well as Rear Commodore, and Vice Commodore. I earned my USCG Masters License with Commercial Towing and Sailing Endorsements as well as American Sailing Association instructor credentials in 2005. 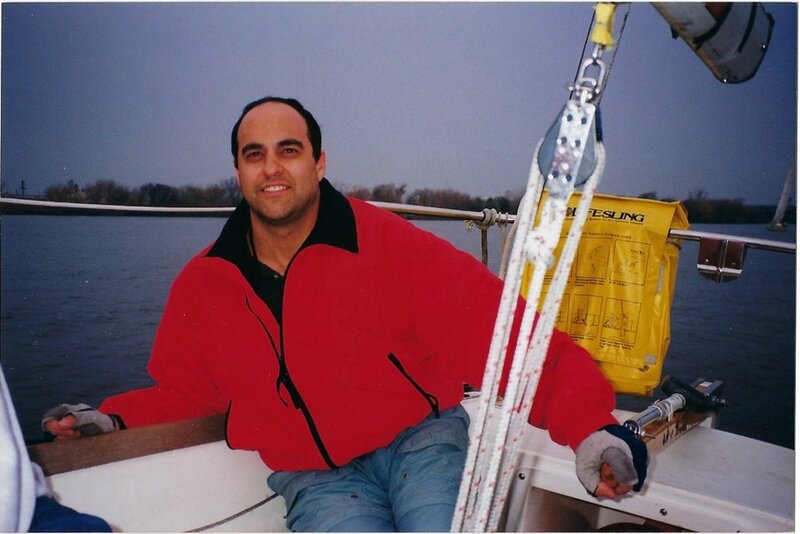 I worked professionally as a sailing instructor, as well as a delivery and charter boat captain. In 2017 I partnered with Captain Davis Jones to create Shardana Sailing Charters. Like Davis, I created Shardana Sailing Charters in order to share with other people, relaxing adventures one can experience only whilst sailing on a comfortable sailboat. I especially enjoy exposing others for whom sailing is not easily or regularly accessible. For me there is nothing like seeing the expression of peaceful serenity on a clients face while anchored out in a secluded cove watching the sun set. I am married to a wonderful woman who happens to be an archeologist specializing in the Sea Peoples of the Mediterranean Sea. In fact our boat, Shardana, is named after one of these sea peoples. When I am not working, I follow my wife around the world as she explores and researches ancient sea peoples. As you may be able to tell, I love the outdoors, adventure, exploring the world around us. I am an avid traveler and love to experience life. Some of my greatest joys is to make new friends and share these types of experiences, including sailing, with others who may not normally get the chance to experience life on the water.